Ujima stand for collective work and responsibility, which I interpret as making each other’s problems our own. In combining this with my desire to help feed those with less, I strive to create delicious recipes utilizing inexpensive ingredients so that they are accessible to many. In other words, trying to make a dollar outta fifteen cents. Yes, I will splurge on fancy ingredients every now and then, but that is certainly not the norm in my cooking. Something clicked for me earlier this year during a run-of-the-mill trip to the grocery store when I came across a package of neck bones for what couldn’t have been more than $2 a pound (and probably closer to $1). I’d never cooked with them before, but I knew that something delicious and comforting could be made. I combined it with a head of cabbage, braised it to coax out all of the wonderful flavors, and ended up with a lot of good tasting food for not a whole lot of money. Our people have a long history of making do with less. Though I’d love for us all to be on an even playing field, I also know that it is the responsibility of those of us with more—be it money, talent, or resources—to help those of us with less. 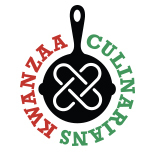 Me using my culinary training to help teach people how to feed themselves well is just one way I try to embody Ujima. Combine the sage, pepper, garlic, and 2 tablespoons salt in a bowl; sprinkle evenly over the pork neck bones to coat. Heat some oil in a large skillet or pot over medium-high heat. In batches, sear the pork in the oil on all sides until browned, 2 to 3 minutes per side. Set the pork aside. In the same pan, add the cabbage and onion and sprinkle with some salt. Cook the cabbage until wilted to about half the volume, about 10 minutes. Add the seared pork, cabbage and onion mixture, and chicken stock to a large pot with a lid. Cover and place in a 325˚F oven until the meat is tender and falls off the bone, 1½ to 2 hours. Let the pork rest in the braising liquid until cool enough to handle and separate the meat from the bones. Discard the bones and add the meat back to the braising liquid and cabbage. Serve over rice with hot sauce on the side. Aaron Hutcherson—a.k.a. "Hutch"—is the blogger behind The Hungry Hutch. It features a variety of savory and sweet recipes that are approachable and meant to be accessible to every cook. The dishes I create reflect a mix of my soul food upbringing, professional culinary expertise, and gastronomic curiosity. This entry was posted on December 28, 2017 by The Hungry Hutch in 2017, Ujima and tagged Cabbage, dinner, food, pork, Ujima.